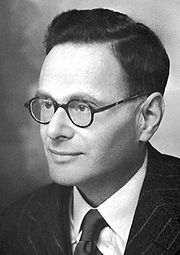 Hans Adolph Krebs was born on August 25, 1900 in Hildesheim, Germany. He was the second child of Georg Krebs, an ear/nose/throat doctor and a biochemist, and his wife Alma. Krebs attended the local grammar school and was briefly conscripted into the German imperial army at the end of World War I. Krebs then studied medicine at the University of Gottingen and the University of Freiburg, and earned his PhD from the University of Hamburg in 1925. He studied chemistry in Berlin for a year and then took a job as an assistant to Otto Warburg at the Kaiser Wilhelm Institute for Biology. He remained there until 1930 when, after briefly doing clinical work in Altona, Germany, he returned to the University of Freiburg, where working with Kurt Henseleit he described the urea cycle, which take place in the mammalian liver. The urea cycle is how mammals remove ammonia (which is toxic in large amounts), from amino acid metabolism, converting it into urea which is excreted by the kidneys. With the election of Adolph Hitler and the rise of the National Socialist (Nazi) Party in 1933 Krebs was dismissed from his position because of his Jewish heritage. After his dismissal Krebs emigrated to England where he took a position at Cambridge University sponsored by a Rockefeller Foundation Studentship grant. In 1935 he was appointed as a lecturer in pharmacology at Sheffield University and in 1938 he was made lecturer-in-charge of Sheffield University's newly founded department of biochemistry. In 1945 the appointment was raised to a professorship and he took charge of the Medical Research Council's research unit established at the university. In 1954 he was appointed as the Whitley Professor of Biochemistry at Oxford University. Krebs' major research accomplishment was elucidating the citric acid cycle (also called the Krebs cycle or the tri-carboxcylic acid cycle.) The citric acid cycle, which takes place in the mitochondrial matrix (inside the mitochondrial inner membrane) in eukaryotes and in the cytosol of prokaryotes, is a cyclic reaction cycle that produces reduced equivalents that are used to produce cellular energy. It is the final set of reactions of cellular metabolism by which organisms break down carbohydrates producing energy and releasing carbon dioxide (for a video showing the series of reactions by which carbohydrates are broken down, highlighting the citric acid cycle, to make cellular energy see here). For his discovery of the citric acid cycle Krebs shared the 1953 Nobel Prize in physiology and medicine with Fritz Lipmann. Other honors won by Krebs include a knighthood in 1958 and election as a honorary fellow of Girton College, Cambridge University in 1979. Krebs died on November 22, 1981.